Steve and Ashley Smolenski of Uniontown, Pennsylvania, wanted to build a simple yet elegant wedding barn to complement an existing cottage on their property. With views of rolling farmland, ponds, and the Laurel Mountains, the new venue was a perfect addition to the property. The Smolenskis approached Quarry View Building Group with knowledge of what is needed to produce quality workmanship. Steve was very familiar with other local contractors, but ultimately the couple chose Quarry View because of our dedication to delivering exceptional work while creating long-lasting relationships with our customers. They knew that no matter what, they were going to be receiving an excellent wedding barn. After many meetings with our new customers, we knew it was important to work with Ashley to help bring her barn design to life. 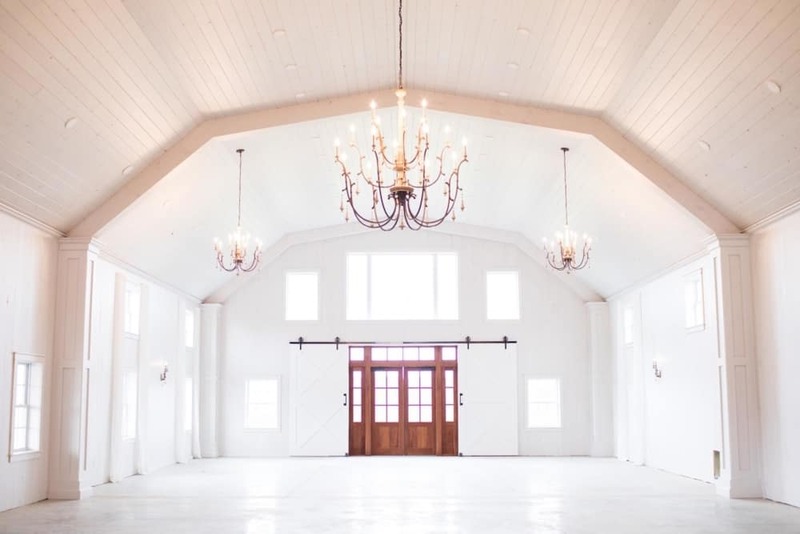 Inspired by Chip and Joanna Gaines, former stars of HGTV’s hit show, “Fixer Upper,” small features were incorporated into the project to create a farmhouse feel, while still providing a stylish space for a wedding. Located on 170-acres, Quarry View worked with Steve and Ashley on the construction of their 4,200 square-foot wedding barn, The Grayson House, which can accommodate up to 300 guests. The project commenced in June 2018. The interior features white washed tongue and groove pine boards from the floor to the 20-foot high ceiling, three gorgeous Parisian chandeliers, and polished concrete floors. A covered cocktail porch, fitted with exposed, dark stained timber framing and a natural cedar ceiling, acts as the entryway to the lawn area where guests can play their favorite yard games. The barn is fully equipped with the necessities needed to enhance your big day like Wi-Fi, a projector and screen, and an in-house sound system. The barn is even fully climate controlled to allow for seasonal weddings and events. We worked very closely with the Smolenskis and respected their desire to perform some of the work. By creating a schedule and understanding what aspects of the project they wanted to complete, we were able to ensure the project was finished on time. We completed construction in November 2018. From the sliding barn doors to the cocktail porch, Steve and Ashley were thrilled with the new wedding barn. The project brought their venue dreams to a reality and validated their decision to work with Quarry View. Currently, Ashley and Steve are working on performing renovations to the small home next to the barn. Known as June’s Cottage, this space can be utilized as a bridal or honeymoon suite for the couples who decide to get married at The Grayson House. Ashley and Steve were pleased to let us know that The Grayson House has booked ten weddings for next year by showing renderings of the barn and giving tours of the space to couples while it was still a work in progress. We’re so thrilled with how this project turned out, and we can’t wait to see the beautiful weddings that will be held there for years to come! If you’re interested in creating your own wedding barn, reach out to us today! We love working with our customers to help create a custom space that’s perfect for your future couples!